Sleep Deprivation is probably playing a part in the somewhat dizzy response that’s emerging from Mexico. The Guardian’s ‘The Deal LIVE‘ is a good example. A more sober assessment of the implications comes from Fred Pearce on the News Scientist’s website. The big picture of course is that no government of a major economy has gone any further in terms of pledges to reduce emissions, but then Political Climate is a sceptic on emissions targets anyway. Domestic politics are simply not in place to facilitate more ambition and that’s unlikely to change for some time. It certainly is good that some of the modalities for a Green Fund have been agreed. Regardless of the justice-based arguments for transfers from developed to developing countries, a cornerstone-type fund and government guarantees will be needed to crowd in investment from the private sector for highly capital-intensive clean energy. Having a pot for money does not, however, guarantee that it will be filled. It’s hard not to be pessimistic in this regard; the Advisory Group on Finance’s report more or less rules out the carbon-related sources of ‘innovative’ finance upon which many have been pinning their hopes; a quick glance at the real world reveals creeping financial contagion in Europe and a hidebound US president who may have to spend money on maintaining Bush’s tax cuts for wealthy Americans. Where is the green fund’s capital going to come from? Technology scarcely gets a mention in any of the coverage of the outcome of COP 16. However, it could be the pick of the decisions. In particular, establishing a centre to match technology needs with suppliers – fulfilling an important market information role, if it works – will actually help cut emissions. The decision on the Kyoto Protocol pastes over the cracks that appeared in the earlier stages of COP 16; these will reappear in Durban next year. The climate world is divided into those who think the KP is the best thing that’s ever happened in climate policy and those that think it’s useless. In fact, the evidence is mixed. Even the EU has only really managed to stay on track by importing hot air through its expansion. However, the KP’s very existence appears to have led to a large expansion in the patenting of clean technologies both within and outside its jurisdiction. Of course, Political Climate’s main concern remains the weak support for action on climate change and lack of consent for climate policy in many nations and these factors haven’t changed. 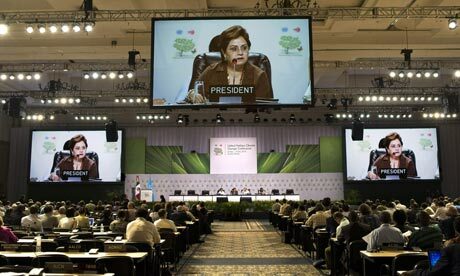 Some progress has been made in Cancún, but only really by avoiding some of the crunch issues and pretending once again that the UNFCCC process is not quite part of the real world. UPDATE: It may be worse than we thought. The Mexican COP ‘deal’ seems to have lent fresh momentum to the treaty bandwagon. See this as an example.